Milwaukee Road 261 is a coal-burning 4-8-4 steam locomotive built in 1944 during World War II by the American Locomotive Company. As the railroad converted to diesels, 261 was retired in 1954 after a somewhat brief career and donated to the National Railroad Museum in Green Bay, Wisconsin. In 1991, the Museum and a group which later became the Friends of the 261 agreed to a lease agreement to restore the engine and operate it from a base in Minneapolis, Minnesota. The fully restored locomotive performed amazingly well, and logged over 25,000 miles during its first 15 years of excursion service from late 1993 through late 2008. After some rocky negotiations regarding a new 15 year lease, the museum eventually agreed to sell the locomotive to the Friends of the 261. The locomotive has been extensively rebuilt again, and operated its first public excursion on a very blustery weekend in May, 2013. This highly anticipated trip took riders from Minneapolis to Duluth, Minnesota on Saturday, and returned to the Twin Cities on Sunday. While in Duluth, passengers had the opportunity to take another steam journey on the North Shore Scenic Railroad behind Soo Line 2719. This 4-6-2 locomotive was also built by American Locomotive Company, 21 years before 261, and was nearing the end of its first 15 years of restored service not long after this event. The impressive Lake Superior Railroad Museum, housed in and around the historic Duluth Union Depot, offered special events during the weekend. Passengers and chasers came from all over the world to participate in this historic coming-out party for 261. We assembled a team of four videographers to capture the excitement of the special trips of both 261 and 2719 from many locations along the routes. This DVD features the most extensive coverage available for the one-time event! Minimal narration - less talk, more action! 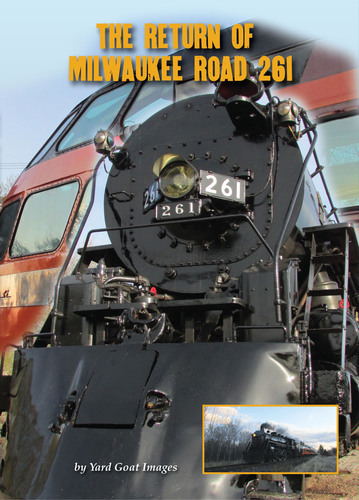 The Return of Milwaukee Road 261 DVD From Yard Goat Images from Steve Mitchell on Vimeo.